Warning: spoilers for tonight’s Gotham episode are ahead! For the latter half of Gotham Season 2, subtitled “Wrath of the Villains,” Hugo Strange has served as the show’s main antagonist, mainly as the mastermind of Indian Hill’s horrific experiments, though we’ve also learned he was behind the murder of Thomas and Martha Wayne. Strange’s machinations continued in tonight’s episode, “A Legion of Horribles,” but for the first time this season, we learned that his experiments haven’t been self funded. 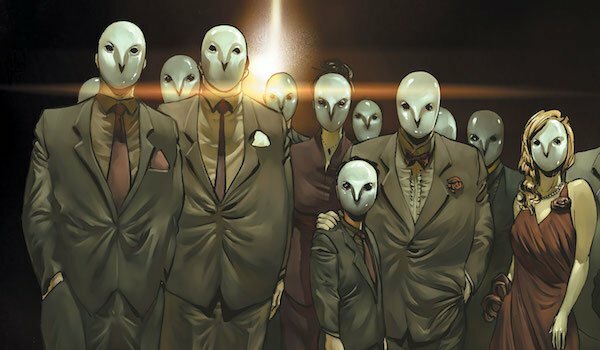 Instead, he’s been acting on the orders of a mysterious organization which went unnamed, but it was immediately obvious to Batman fans that this was Gotham’s version of the Court of Owls, a secret society that was only introduced in the comics five years ago, but has enjoyed enormous popularity since then. Throughout this season, Strange’s main goal has been to resurrect the dead, and he was finally successful at the end of “Pinewood” when he brought former mayor and main antagonist Theo Galavan back to life. The problem was that Theo’s original personality and memories didn’t resurface following the revival. To make up for that, Strange lied and told him he was Azrael, the Warrior of Vengeance, so that he would hunt down Jim Gordon, who was digging too closely into Strange’s affairs. Azrael was defeated at the end of last week’s “Unleashed” (and by defeated, I mean blown up by an RPG), but he’d already been seen by enough of the public, including the Court of Owls, represented in this episode by an older woman wearing, of course, an owl-themed mask. Contacting Strange via one of the security monitors in his office, the woman chastised him not only for his experiments drawing too much attention, but for not bringing anybody back to life with their memories and “soul” intact (which also now includes Bridget Pike, a.k.a. Firefly, who thinks she's a fire goddess). Fortunately for Hugo Strange, he proved her wrong, as earlier in the episode, he resurrected Gotham Season 1 baddie Fish Mooney, who we last saw falling off a building into Gotham City's murky depths. When Strange tried to convince her she was a war goddess, she suprisingly declared who she really was. It’s unclear what was different about her compared to the other subjects, whether it was the cuttlefish DNA combined with hers, the increased voltage to her brain or something in the water where they found her body, but regardless, her personality is fully intact, and it’s only because of this that the Court didn’t sack Strange. Satisfied enough, the Court of Owls member told him to proceed with replicating these results and to deal with Bruce Wayne, who at that point was snooping around Arkham Asylum with James Gordon and Lucius Fox. In the comics, the Court of Owls, created by writer Scott Snyder and artist Greg Capullo, are made up of Gotham City’s wealthy and elite, and they’ve been pulling the city’s strings behind the scenes since Colonial times. To enforce their rule, they use Talons, assassins trained from a young age to be completely loyal and eliminate any threat to the Court’s plans. The members are also able to bring long-dead Talons back to life using a special serum, and the only ways to defeat these “zombie” killers is using a poison developed by the Court or exposing them to extreme cold. Before the New 52 Batman book began, the Court was considered a legend by most of Gotham City, but Batman discovered the truth in the present day (nearly at the cost of his own life). More recently, their presence expanded worldwide, to the point that they’re now called the Parliament of Owls, but Gotham City will always be their main location. Until Gotham, their only appearance outside of the comics was the animated movie Batman vs. Robin. Gotham executive producer Bruno Heller mentioned last year the the Court of Owls would eventually be explored on the show, and with Season 2 almost concluded, they’ve finally been set up. Because the Court is such a massive threat, fans can likely expect them to resurface sometime during Season 3, where we’ll meet more of the members and hopefully get a sense of just how powerful they are. So what is the Court they hoping to accomplish with Strange’s experiments? Within the show, that’s still unclear, but as mentioned earlier, the Court in the comics uses resurrected Talons. Strange’s experiments have revolved bringing the dead back to life, so we can deduce that they want to use his process to bring their assassins back to life in this world, and it’s crucial that their motives and personalities remain intact rather than be fed fake ones. Now that this has been accomplished with Fish Mooney, the Court is one step closer to accomplishing their mysterious schemes. However, with Fish’s resurrection comes an interesting twist. The former crime boss learned that she is now able to controls others when she’s in physical contact with them, as evidenced when she grabbed an orderly and demanded he make her a grilled cheese sandwich, and he later returned with one. Fish using this new ability will undoubtedly lead to trouble on its own, but assuming that Strange repeats this process on his other subjects, it does beg the question if others will also be granted this ability. That would make the Court’s Talons even more dangerous than they already are, and definitely wouldn’t bode well for Gotham’s protagonists. Gotham Season 2’s finale, titled “Transference,” airs next Monday at 8 p.m. EST on Fox.